Guam may be quite a bit closer to Pyongyang, Tokyo and Manila that it is to Honolulu, Seattle and Los Angeles, but the steps to the Territorial Legislature Building are just as American as the steps to the US Capitol. 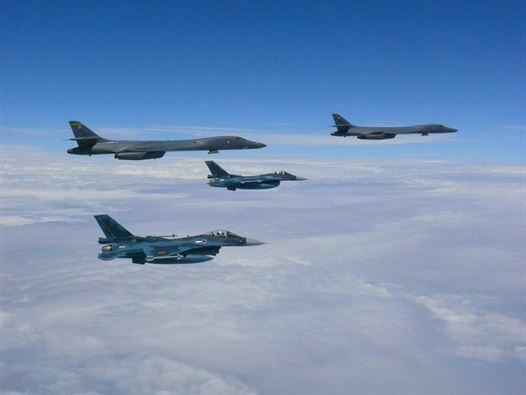 And to prove that point, the US Air Force has reassigned 350 airmen and two B-1B Lancer bombers to the slice of America in the Western Pacific.As the Air Force’s Pacific Command sent via Twitter, the Air Force is ready to #FightTonight. The two state-of-the-art Lancers are for at least the time being, assigned to the 37th Expeditionary Bomb Squadron, stationed at Guam’s sprawling Andersen Air Force Base at the northern end of the island. 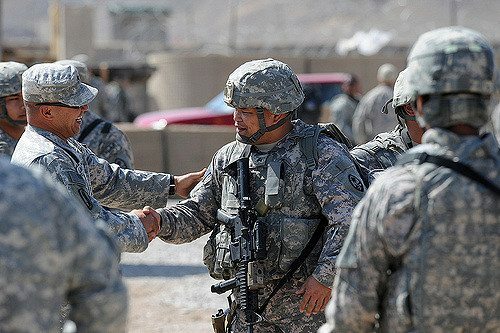 Buddies meet again: Members of the Guam National Guard’s 1st Battalion, 294th Infantry Regiment serving in Lashkar Gah, Afghanistan. Worth fighting for – local girls at Tumon Beach. Other than Andersen AFB, Guam is the headquarters of the 7th Fleet’s Navy Expeditionary Forces Command Pacific, the nuclear subs of Submarine Squadron 15, and the Naval Special Warfare Unit One.